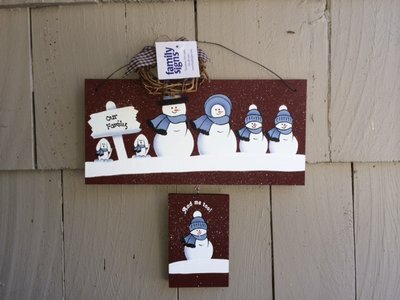 At Family Signs, it is winter all year round! In January, owner Paula Cullen starts by cutting the wood. The lengths are determined by the number of family members to be painted. The boards are sanded and holes are drilled for the wire hanger. Then it's on to painting the background color. Paula's mother, Sue, is using a quality exterior paint applied with a roller. The boards are put on racks for drying. Each sign is hand painted with a technique called tole painting. The shading and stroke work are combined to give each sign a professional decorative look. Paula has been a member of the National Society of Decorative Painters since 1986. Her design is registered with the United States Copyright Office #VAu400-773. The signs are then assembled by Paula and Lucy, who add the wreaths, wires, and bows. Paula is then ready to personalize the signs on an order-by-order basis whether at craft shows, through craft stores or by mail order. Every effort has been made to offer a quality hand-crafted product at a reasonable price. The standard family signs include up to four children with any combination of two pets (cats and/or dogs). Grandparents love our grandchildren signs! Special orders are always welcome.